Your home is overvalued. If your home is listed for too high a price, it’s just not going to sell. Tacking on the amount of money you’ve spent on improvements doesn’t necessarily translate to added value, either. Compare your property to similar homes within your neighborhood to get a better idea of its current value. An experienced REALTOR (like us!) can give you an accurate value of your home. We also watch the market activity to know if the market is shifting, as the market may change from the time that you first listed your home to today. Your marketing is poor. Unfortunately, we see this one quite a bit. Poor (or not enough) photography that doesn’t properly showcase your home means that home buyers are going to skip over your home for the next one. A poorly written description of your home that doesn’t highlight its unique features can also be an issue. We work with you to create marketing pieces with professional photography that attracts the attention of target buyers for your home. You’re hanging around for showings. While you may want to greet potential buyers with a smile and show off your home, this is a no-no. Buyers feel awkward when they feel the seller is hovering around. The last thing you want to do is make a buyer associate your home with bad feelings. It’s best to stay away. You’re too attached. If you don’t want to negotiate even a penny from your price, then there’s a chance that you’re too attached to your home. If there’s a part of you that thinks your house is the best in the world or doesn’t want to sell, then chances are that you’re going to have difficulty coming to an agreement with any buyer. Your home is not professionally clean. A dirty house is also going to leave buyers with a bad impression. You may not have to hire a professional, but make sure that your home is clean to their standards with a good deep clean and stays that way for showings. Your home is not staged. You want your furniture and décor to help buyers feel at home. If you’ve already moved out, an empty house also shows smaller than it really is. If you have an awkward space in your home, use staging to tell potential buyers a story of how it can be used. Your personal décor is up. You don’t want potential buyers to be distracted with your personal belongings. Family portraits and other mementos tell a buyer how well you fit in your home, not how they will. Take down your personal décor so they can have an easier time imagining their belongings in your home. The improvements you made are too personalized. Custom murals, hyper-stylized rooms, and other improvements that stray too far from mainstream design can scare of buyers who aren’t interested in paying for something that they’re going to change. You may find a potential buyer who shares your exact same taste, but then you’re eliminating most potential buyers for your house. You want your home to appeal to as many potential buyers as possible. There’s too much clutter. Even if your home is clean, if there’s too much stuff in there, it can be a problem. A cluttered house with too much furniture and décor can make your home feel smaller than it is. Your home needs a lot of repairs. The more repairs that your home needs, the less likely buyers will want your home. Most buyers are looking for something move in ready so that they don’t have to deal with the cost or effort of repair work, even if the repairs are small. A home that hasn’t been well maintained also will make buyers think that there are even more expensive repairs hiding where they can’t see. You chose the wrong real estate agent. In our opinion, this is the most important decision you can make when selling your home. A great REALTOR will do more than give you an accurate value for your home and do a great job marketing, they will also come alongside you to give you honest feedback to make sure that your goals for selling your home are met. They will know the market and give you reasonable expectations and options so that you can maximize the value of your home. All these reasons can be addressed, but the longer your property sits on the market, the more likely it will be stigmatized by buyers and the less likely it will sell at your asking price. Choosing a great REALTOR from the beginning is the best way to avoid making these common mistakes. If you are thinking of selling your home, give The Gina McKinley Group at call at 480-355-8645 or email info@locatearizonahomes.com today! 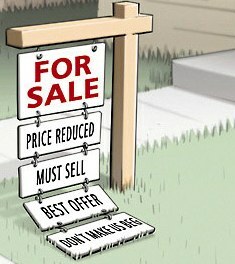 We would love to help you navigate the current real estate market and sell your home for the best price for you.